Don't abandon or throw out your church's heritage! It is not unusual when a congregation is planning a new church building for it to be faced with the question "How can we use our historic sacred glass in the new building?". Unfortunately, the church often concludes incorrectly or is wrongly advised that its old stained glass must be left behind when it moves into its new facility. However, there are many options available for the use of these windows. David Wixon & Associates is available to explore specific ones with our client and to explore the costs and implications of various alternatives pertaining to their particular circumstances. To begin, here a a couple of suggestions. 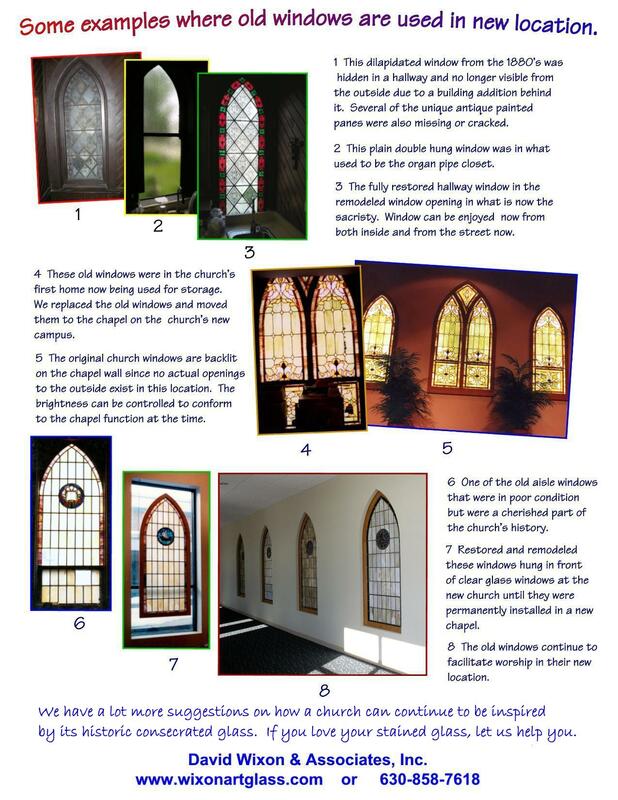 Frequently, when a church has old windows that they do not know how to utilize in a new building, it is for one or more of the following unsupportable reasons for not using old stained glass in new buildings. 1. The architect does not want to use the old windows. Too much trouble, they don't fit the new architectural style, they conflict with his/her artistic vision, and similar excuses. Most of these reasons can be boiled down to the simple fact that the architect is not familiar with stained glass and/or does not want to be bothered with that old stuff. If this glass is important to your congregation, you should definitely insist on its use somewhere, somehow. 2. The old glass is considered unsalvageable. It is often true that the old stained glass may not be in good condition. However, we have found that in almost all circumstances it can be restored. In the process we can also remodel it so that it ends up a different size or shape, too. The cost to do this is unlikely to exceed the cost of new stained glass and, in the long run, is worth investing in over just plain glass in any new window openings. 3. It is assumed that all stained glass must have a natural light source. In fact, even where no actual window opening to the outside exists, it is possible to install stained glass and to illuminate it artificially. Artificial lighting has some extra advantages. The window can be lit so that it can be seen from the interior after dusk. With artificial lighting it is also possible to turn the window off at any time so that where it is located can be darkened for such things as dramatic productions or image projection on to a screen. 4. Stained glass of any kind is assumed to be fragile. This need not be the case. A stained glass window well made and in good condition is by itself strong. And, materials now exist that can be attractively and inexpensively mounted in front of or in back of the window that will further protect it from vandalism from the outside and such things as bouncing basketballs from the inside. 5. 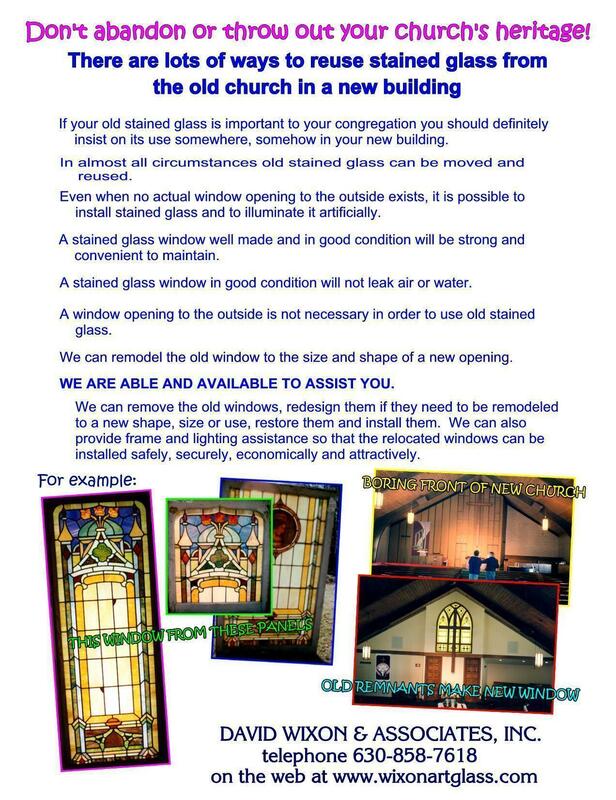 Stained glass is wrongly assumed to be a poor insulator. However, a stained glass window in good condition will not leak air or water. It will be same as any other single glazed window. If insulation is a concern in your environment, attractive and economic frames can be part of your new building that will hold both the stained glass and a layer of secondary glazing. Is is usually also possible to add this to a building at a later date although we recommend a frame built to hold secondary glazing be installed in the church at the time it is built. J. Sussman, Inc., is a good source for these kind of frames. They may be contacted at www.jsussmaninc.com. 6. For whatever reason, there may be no window openings in the new building. As mentioned before, a window opening to the outside is not necessary in order to use the stained glass. 7. The window openings are not the same size and/or shape of the old windows. We can remodel the window in an appropriate manner for the opening you have for them. 8. Your church may assume that there is nobody available to help them accomplish its objectives.